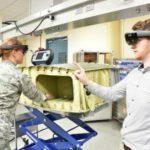 The U.S. Air Force Research Laboratory’s Materials and Manufacturing Directorate has started leveraging commercial-off-the-shelf augmented reality systems to develop an approach that will help aircraft maintainers inspect internal components of a plane. Wright-Patterson AF Base said Thursday the AR-based capability is expected to streamline nondestructive inspection, which is a process of safely assessing hard-to-reach equipment and materials in a structure for defects. Eric Lindgren, principal materials research engineer at the Air Force, explained that NDI officials simultaneously check the monitor, technical documents and surface during the inspection under challenging conditions, which can tire inspectors. 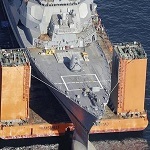 AFRL researchers believe the refined NDI process would take away from the load of inspectors the task of assessing several displays and/or documents so as to focus on the inspection process. AFRL is working with the AFRL Virtual, Augmented and Mixed Reality for Aircraft Maintenance integrated product team to develop the system, which they hope will be used in a laboratory environment and other operations in the future. The researchers also expect to modify the feature to point out the critical areas of a material to be inspected, as well as ultimately help complete the inspection. They also aim to integrate the AR system into smaller wearable systems such as safety glasses, which aircraft maintainers already use during inspections.